I had a Mulberry bag on a mental wishlist back in the pre-blogging days, when my wishlists never made it to paper (or should that be computer?) This isn't the exact style I had my eye on back then but I do seriously love this design. Simple, beautiful and it just looks expensive. Swoon. A well loved designer brand amongst bloggers, along with one of their stunning rose gold timepieces I'd also love to get my hands on a Michael Kors bag too. As far as designer bags go the prices are actually quite reasonable- there are a lot within the £300/£400 price bracket compared with £1000+ for other designer bags. This one is £295 from Zalando, it comes in a few other colours too my favourites being the black or navy. Another Michael Kors, I can imagine this Jet Set bag would be perfect for throwing over your shoulder while you hop on a plane and travel the world. I can't say too much of that goes on in my life, but a girl can dream! I think you'd have to be careful not to mark the white leather, but isnt it beautiful? Another slightly more 'affordable' bag at £300, I love the larger size, the clasp along the top and the ivory colour. The gold star shaped studs along the top give it a slightly more fun and casual finish. I actually like that this one doesn't come with the additional shoulder strap like most bigger bags these days, and this is the exact style that I usually go for in bags. Finally, the ultimate- Chanel classic flap bag. This is just a thing of beauty, I practically hear angels sing whenever I look at it. At over £3000 it doesn't come cheap, and as ridiculous as I think this is for the price of a bag oh myy do I want it! This isn't something I'd ever save up for and attempt to buy (would take me about a decade anyway- ha) but if I were to win the lottery I'd have this in my collection for sure. 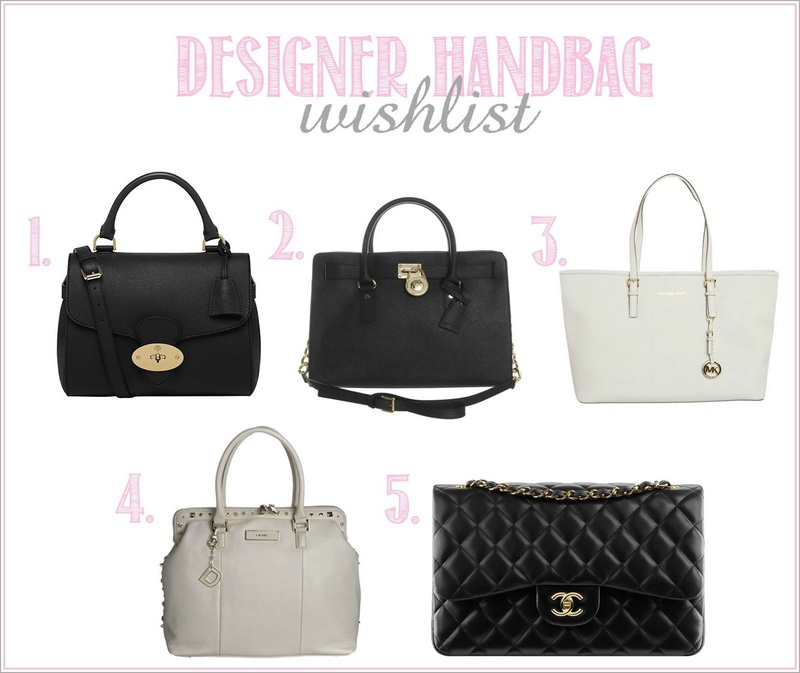 If you could have any designer handbag, what would you go for? I'd really love a mulberry in a brown leather! As owner of a Kors Jet Set, I can tell you it's AMAZING for travel. They come in various sizes too, which is fantastic. ohh we definitely have the same taste in bag! I'd pick black and white ones over colored ones! :) Nice picks too! Love all these bags, but my fave is Mulberry's. So cute! I luuuurve the Mulberry one, defo on my wish list!! Im totally wishing for the MK jet set tote too!! I actually just got the Selma as a christmas gift and I love it!